The Academy’s art history school provides specialized academic study that pairs art historical theory and criticism with the study of the fine and applied arts. This unique pairing presented in a single-study academic environment ensures that our graduates develop and acquire skills necessary for employment in the arts sector and elsewhere. The Art History programs are designed around the study of art, the artist and their techniques; building a well-rounded education of the art historical narrative through the material presented in art history, studio and foreign language courses. 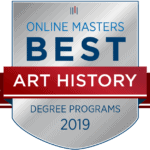 Explore and discuss art and artistic methods at Academy of Art University’s School of Art History, becoming part of the academic art historical narrative with your contribution to the field. As a graduate of our Art History school, you will be a passionate and determined thinker. You will challenge people’s understanding of past cultures and discuss art and architecture through their place in our own historical narrative. We will train you to marry the historical and material study of art through an understanding of artists, periods, and styles—by learning about the past to make it come alive in the present. We will examine the art, archaeology, architecture, and ideology that comprised the foundation of the ancient Greek civilization, and how it has influenced Western culture. You will write and present research papers to critically assess how such a culture became a fundamental phenomenon ingrained in the values and arts of today. All art history starts from a foundation of theory. As an art historian, you will use theory to challenge scholarship, and through that dialogue, find your own voice and methodology on the way to becoming part of the next generation of intellectuals and art history specialists. You will learn to examine the art of the 17th century Dutch Republic and its surrounding regions. Artists covered include: Rembrandt, Rubens, Van Dyck, Vermeer, Hals, Dou, and Leyster. Students will engage in critical analysis of artwork through application of primary source readings and seminal theories of Netherlandish scholarship in written work and presentations. We will impart knowledge of traditional methods of production and techniques used by the great artists of our past to help you understand their work's intention and value. You will develop an appreciation of their artistic methods and how they directly relate to how we understand the work as we discuss its creation. Lorenzo Ghiberti’s “Gates of Paradise” (1425-1452) stands as an achievement of the creativity and brilliance of the Florentine imagination during the early days of the Italian Renaissance. This video examines the narrative and stylistic charm of each panel as seen in the copy at Grace Cathedral in San Francisco. Being surrounded by art such as this is just one of the many perks of studying art history in San Francisco. Access to the leading scholars and scholarship is essential for preparing students for employment in the art historical or related field. This comes in the form of online resource guides that connect you to JSTOR, Oxford Art and other leading scholarly journals and publications. Our faculty makes the difference. They are art history industry veterans who help bridge the needs of the art history industry with the curriculum and experience our students get. When I was looking for an internship, I knew I wanted to be doing something in museum studies, and museum education is a great entry point for my professional career. One of the best ways to learn about the world is to see the world. As we work together to turn your passion for art history into a rewarding career, we will delve into the numerous ways in which we can elevate your experience in class and beyond through our exciting Study Abroad opportunities. As an art appraiser, you'll work in an auction house appraising a variant of art pieces to help collectors and galleries grow their collections. With your knowledge of historical and artistic significance, you'l set the pace for the art world and its value in the cultural landscape. As a corporate art consultant, you'll work with private corporations as an art buyer, assessor, and art investor to assess potential additions to the collection. Understanding works of art as both a financial investment and as part of a growing collection, you'll create a portfolio of art that speaks to a specific message. As a museum or gallery curator, you'll work as the content specialist in charge of the institution's collection. Interpret the material, organize its exhibition , and provide historical context through materials, catalogs, and labels. As an art writer/reviewer, you'll work in a publishing house reading and reviewing art-related materials. Working in teams, you'll fact check, revise, and edit everything from articles to books.